The historic stone bridge across the Loire from Blois-Sud ends in Blois at the place de la Résistance, where there are numerous café-restaurants. Though good for people-watching, and with a nice view of the bridge, the square, streets and bridge can be busy with traffic, and thus a bit noisy.. 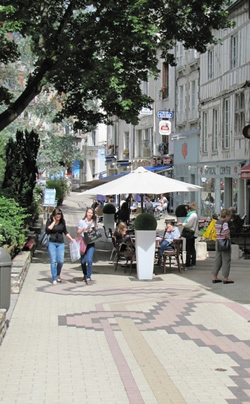 This street running north away from the river and the place de la Résistance is lined with little cafés and restaurants all the way to place Ave Maria, where there are more indoor and outdoor restaurants, including Vinomania, specializing in vintages of the Loire Valley. The main street leading from the place de la Résistance up the hill, then left (west) to the Église de St-Vincent and the Château Royal de Blois, is dotted with restaurants, cafés and ice cream shops. Sidewalk café on rue Denis Papin not far from the Château Royal de Blois.